Language Link has many years experience in working with the Department of Immigration and Department of Labour in Vietnam. We maintain a good relationship with these bodies in order to ensure we can provide a high-quality service to our teachers when it comes to working to procure Visas and Work Permits. HR has a number of team members dedicated to these tasks and at all times, your Welfare Officer is available to provide additional support. + How do I get a Work Permit? + Why do I need to go to my Embassy and what do I have to do there? + Who shall I give my documents to after going to the Embassy? + Do I have to pay for the services at the Embassy? To work for Language Link, you will need a visa sponsored by the company. The process for obtaining this is very straight forward. To get a DN visa, Language Link will provide you with a Visa Invitation Letter. 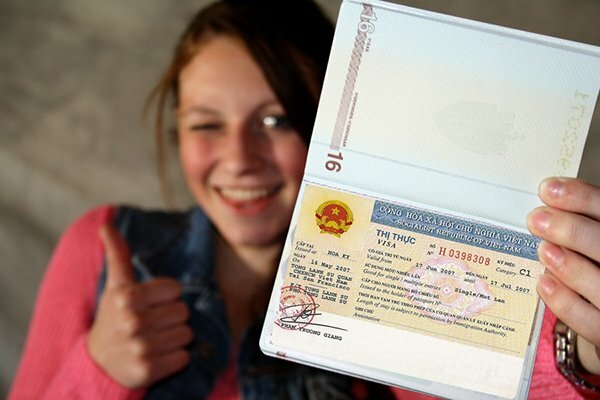 – If you are an Overseas Hire, we will obtain this before you arrive and you will enter Vietnam on this Visa. – If you are hired locally, we will obtain a letter for you and you will be required to do a Visa Run to a neighbouring country (typically people go to Bangkok, Thailand). In either case, you will pay for the Visa at Immigration when you arrive into/back into Vietnam. The fee is $50.00 USD. The DN Visa will be a 3 month Multiple Entry Visa. For Full-Time employees, Language Link will reimburse you the cost of the Visa. This will be subject to tax. You will need to bring the receipt to HR. During the period of the 3 month Visa, Language Link will work with you to obtain a Work Permit (see below). Once a Work Permit is obtained, Language Link will extend your 3 month Visa for the duration of your contract plus 7 days. You will not be required to do another Visa Run. For employees who have a Work Permit, when the LD Visa runs out, assuming that the employee signs a new contract, we will obtain a Temporary Residence Card (TRC). This will run for the length of the Work Permit and typically makes coming and going much easier. For Part-Time Teachers, Language Link will assist with the administration of obtaining a Visa, but it will be at the employee cost. To work in Vietnam legally, you will need to obtain a Work Permit. For Full-Time employees, this is fully funded by Language Link (with the exception of document notarisation/legalisation). For Part-Time employees, Language Link will assist, but the cost will be covered by the employee. – Go to the relevant Embassy to get your Degree, Teaching Certificate and Police Check legalised/authorised/notarised/Certified True Copy. – Submit documents to HR. – HR will arrange an appointment for you with a hospital for a Health Check. This is mandatory for all employees in Vietnam. You need to inform HR of your availability. + Firstly, get a Landlord Form (Residential Stay Permit) from HR. + Get your Landlord to complete the form and register you with the local police department. + Submit the completed form to HR, who will then arrange an appointment for you with the Department of Justice to apply for a Police Check. In most cases HR will send someone to accompany you to the Department of Justice. Why do I need to go to my Embassy and what do I have to do there? To get you a Work Permit to work for LLV legally, you need to go to your Embassy or the Embassy of the country where your documents were issued to get your documents (Degree, Teaching Certificate and Police Check) legalised/authorised/notarised or to make a Certified True Copy. Who shall I give my documents to after going to the Embassy? You should bring your legalised/authorised/notarized/Certified True Copy documents to the HR Office or give them to a TWR Officer at your base location. Do I have to pay for the services at the Embassy? Yes, you have to for pay it yourself. It’s mentioned on your contract. LLV sponsors all Full-Time teachers for a Work Permit and Visa, but teachers are responsible for getting the required documents (Degree, Teaching Certificate and Police Check) notarized at the relevant Embassy and paying for that service. The process for British Nationals, or people with certificates from British Institutions, is different as the British Embassy does not offer document legalisation services in Vietnam any longer. LLV has an agreement in place with a provider in the UK to help with this process. For Part-Time Teachers, Language Link will assist with the administration of obtaining a Work Permit, but it will be at the employee cost.